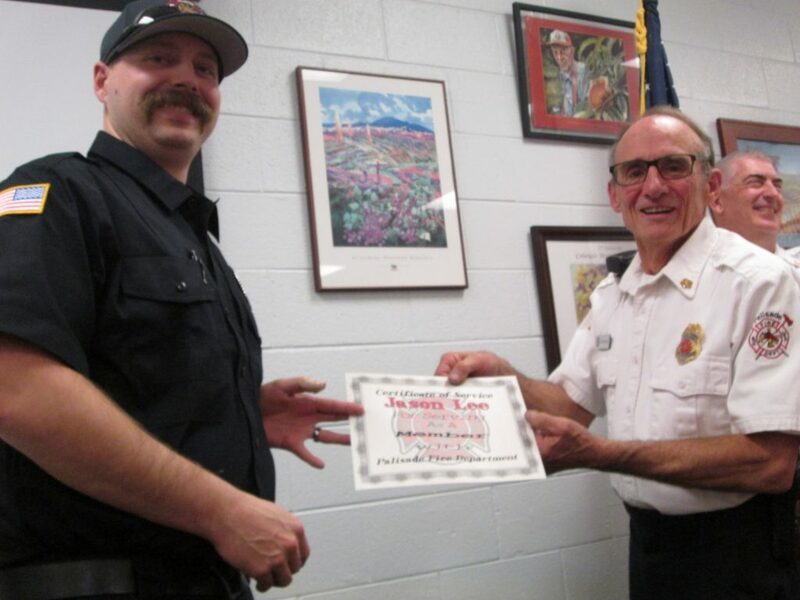 Jordan Meuller (left) was named Firefighter of the Year, 2016. 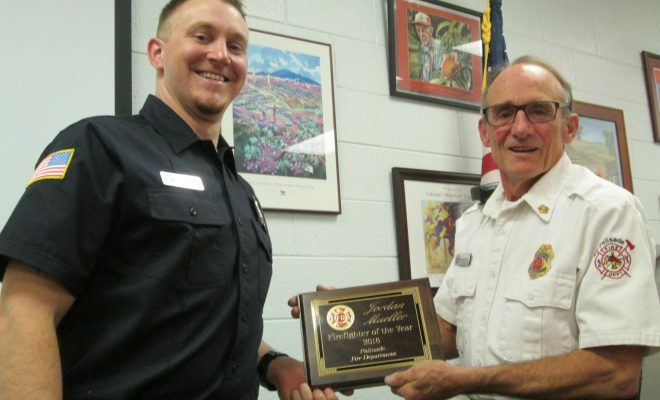 Meuller was presented a plaque by Fire Chief Richard Rupp at the Feb. 25 Palisade Fire Department Appreciation Dinner at the Palisade Civic Center. Photos by Bill Hoffmann. 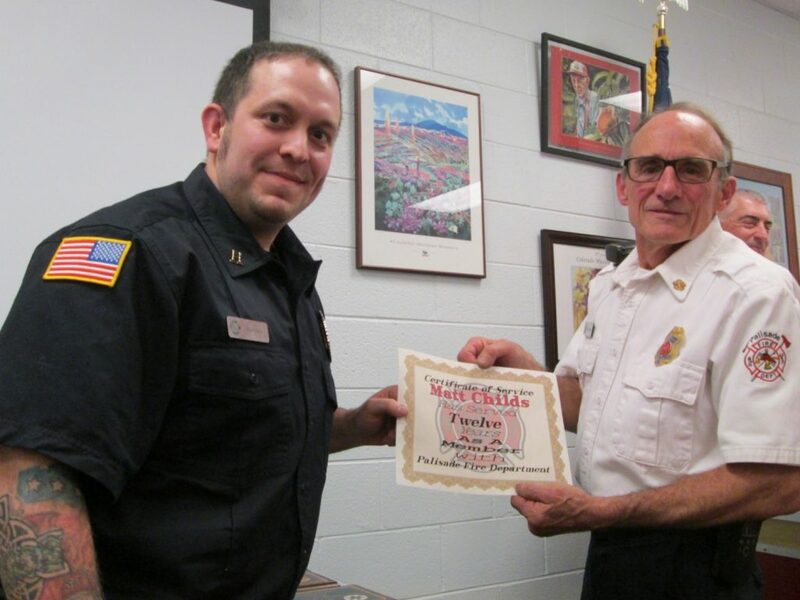 Awards, laughter, and applause kept the Feb. 25 Palisade Fire Department’s Annual Members Appreciation Dinner lively. 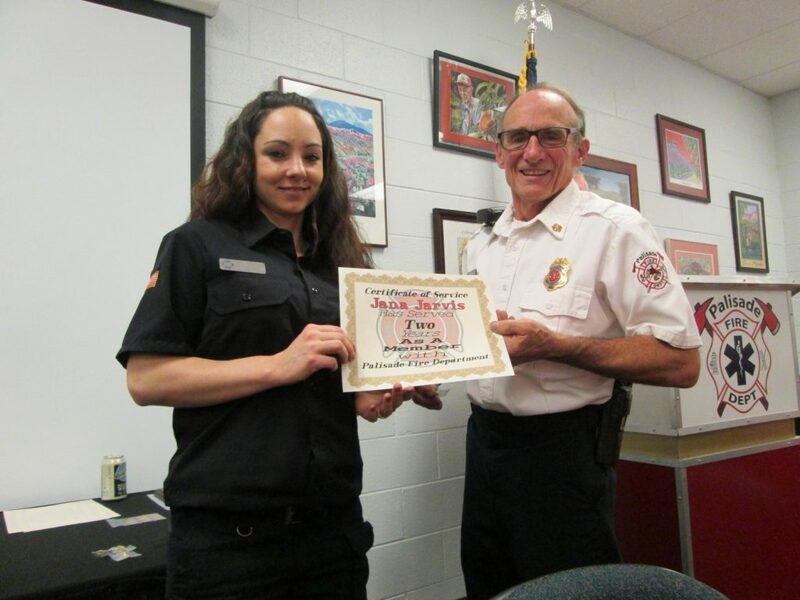 The catered dinner, held at the Civic Center meeting room, hosted 76 people, including 37 volunteer firefighters, guests, and officials from the Palisade Rural Fire Protection District and the town of Palisade. Six volunteers were not able to attend. Also recognized were EMS officials and retired fire department firefighters. 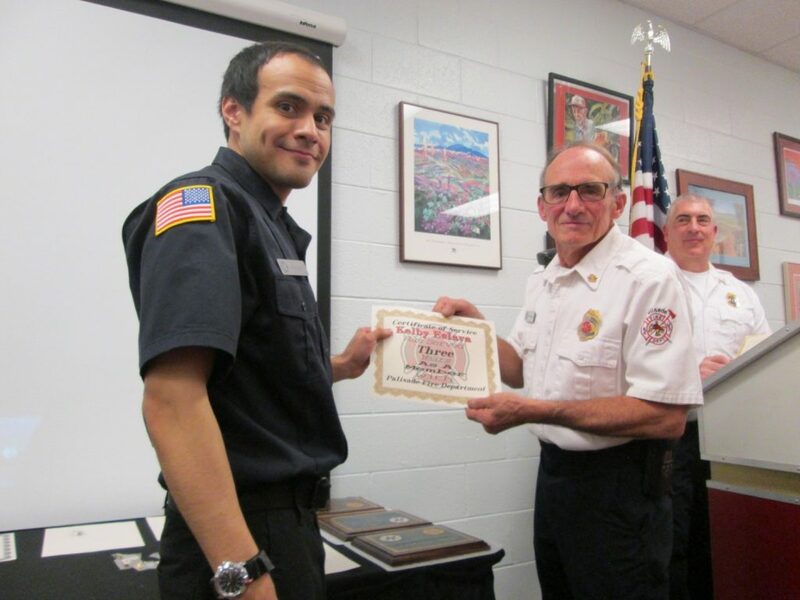 The presentations were interrupted briefly for two real-life EMS life support calls. The calls required several volunteers to leave, as well as Joe White, EMS chief, one of the two masters of ceremony. Fire Chief Richard Rupp picked up where Chief White left off. 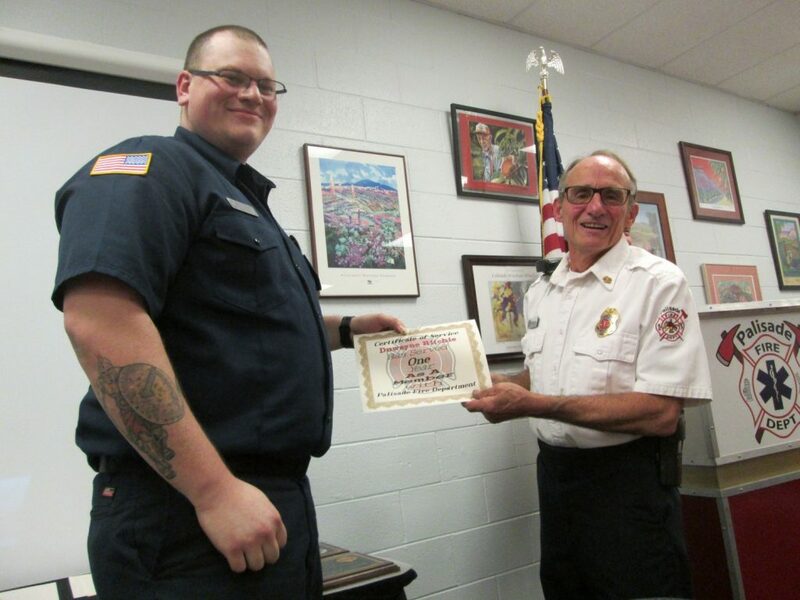 Jordan Mueller was named the 2016 Firefighter of the Year, Kyle Erickson was named EMS Provider, Jordan Quackenbush was named transporter and driver of the year, and Marc Silingardi was recognized as author for writing EMS patient care reports. White’s year in review included recognition of the Phoenix award recipients. They were recognized for each responding to a patient experiencing cardiac arrest, but who recovered successfully. The recipients were Matt Childs, Kelby Eslava, Katlyn Bremmer, DuWayne Ritchie, Chance Shepherd, and Jennifer Young. The list of accomplishments includes the purchase an ambulance to replace one damaged by an undercarriage fire. In his closing remarks at the dinner, Chief Rupp said to the volunteers, “We appreciate everything everybody does,” especially the hours they put in. 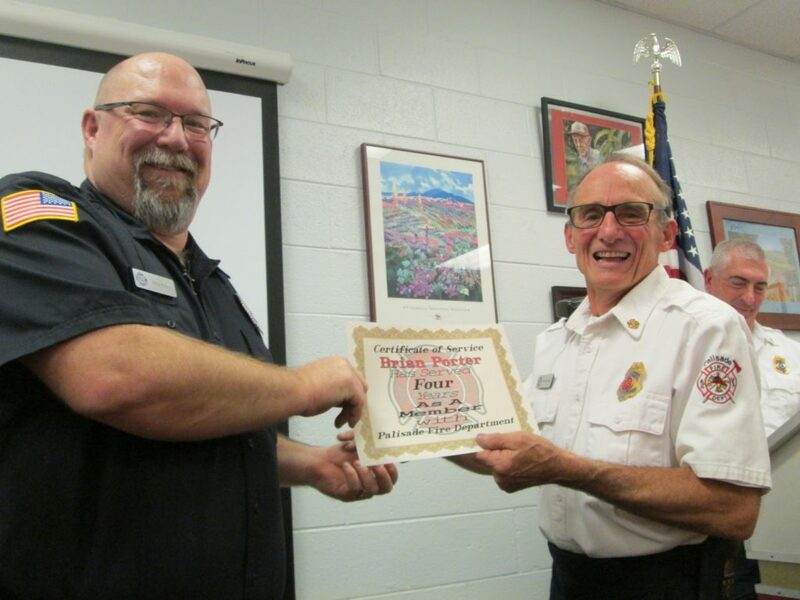 Mayor Roger Granat then presented a special award to Chief Rupp in recognition of his 34 years of service in the Palisade Fire Department. 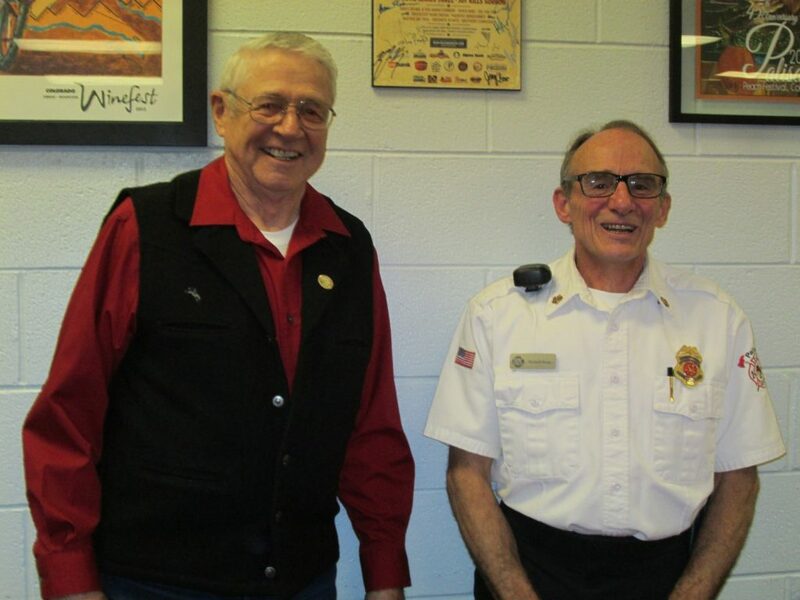 Members of the Palisade Rural Fire Protection District board were represented at the dinner by Gary Rupp, president; Elaine Korver, and Tom Griffiths. 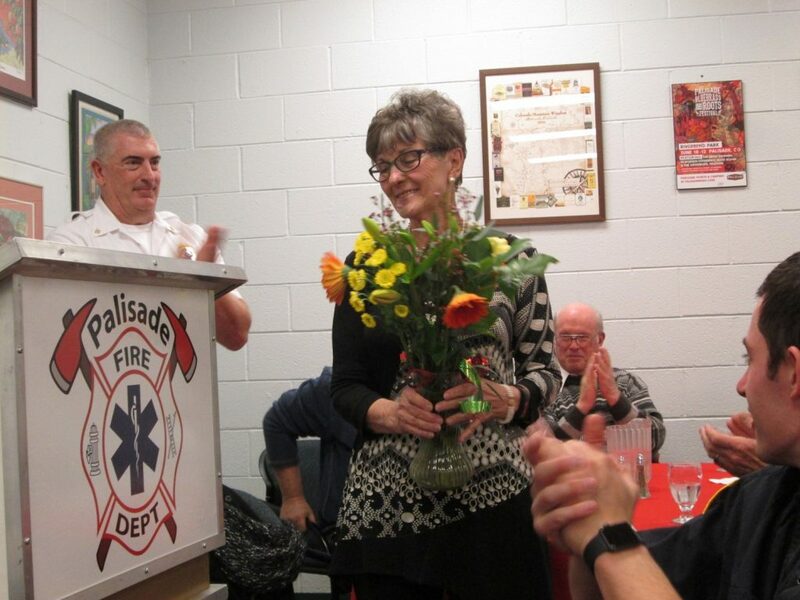 Maggie Sommerville, recently retired from the board, was recognized for her service. Town officials attending included Mayor Roger Granat, Mayor Protem Dave Edwards, Trustee Penny Prinster, and Town Administrator Rich Sales. White in an interview later explained that 77.2 percent of the calls are emergency medical service calls. The volunteers become certified, “Protocal,” by training with doctors at St. Mary’s Hospital. They participate in 15 to 20 calls and meet with doctors twice. “Then they can run on medicals themselves,” White said. White said volunteers participated in more than 5,000 hours of training in 2016. Asked about compensation, White said each volunteer receives $10 a day and $10 a call. It provides recognition, pays for gas, and they gain experience, he noted. Chief Rupp, Chief White are full-time paid staff and Kyle Erickson is part-time paid staff. Asked about the history of EMS, White said the first paramedics started in Los Angeles decades ago, noting that the first ambulance was a hearse. The first nationally recognized EMS curriculum was published in 1969, according to Wikipedia. The catered dinner, prepared by The Cowboy and the Rose, Grand Junction, drew rave reviews. 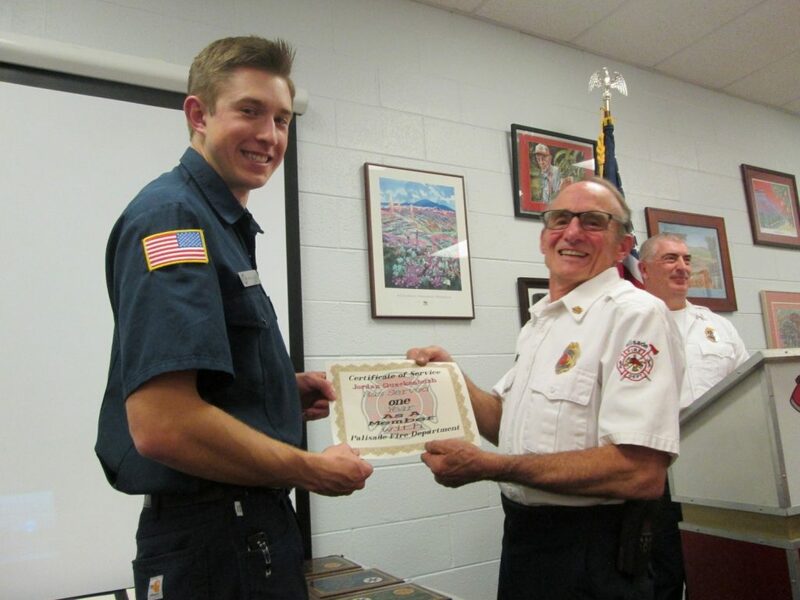 Volunteers receiving certificates of appreciation were Zach Adams, Alex Almy, Joseph Billings, Devin Bogle, Katlyn Bremmer, Matt Chiles, Stacie Dix, Kyle Erickson, Kelby Eslava, Ashley Frick, Brenda Gallegos, Courtney Garcia-Hays, Kyle George, Andrew Giandonato, and Collin Girardi. Also, Ryan Glassman, Jake Harsha, Kevin Henderson, Aaron Hicks, Bill Hokanson, Bryan Huff, Jana Jarvis, Jonah Larson, Jason Lee, Charlotte Martin, Jessica Miles, Jordan Meuller, Matt Pipes, Brian Porter, Phillip Prock, Jordan Quackenbush, Bryon Rasmussen, DuWayne Ritchie, Jayme Rowe, Chance Shepherd, Marc Silingardi, Nick Stanko, Christin Westermire, Gordon York, Jennifer Young, and Mike Zeek. 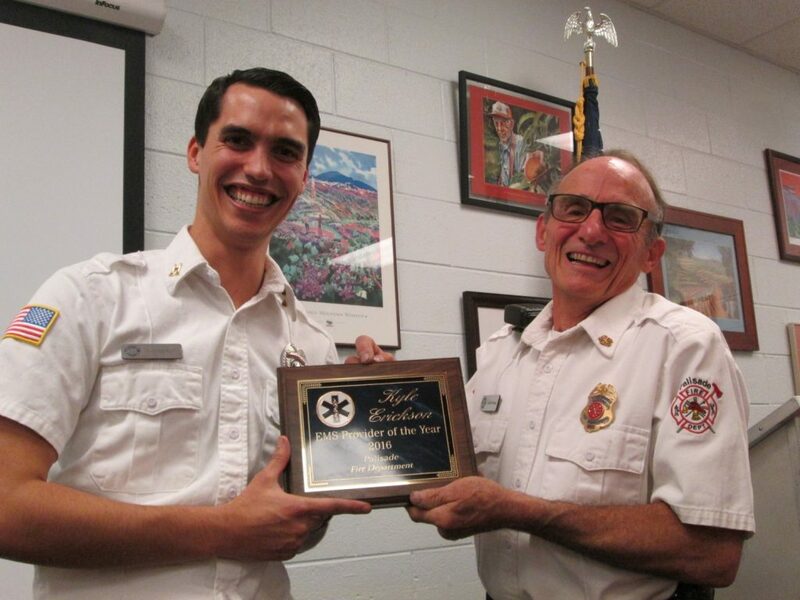 Kyle Erickson (left) was presented EMS Provider of the Year by Fire Chief Richard Rupp. 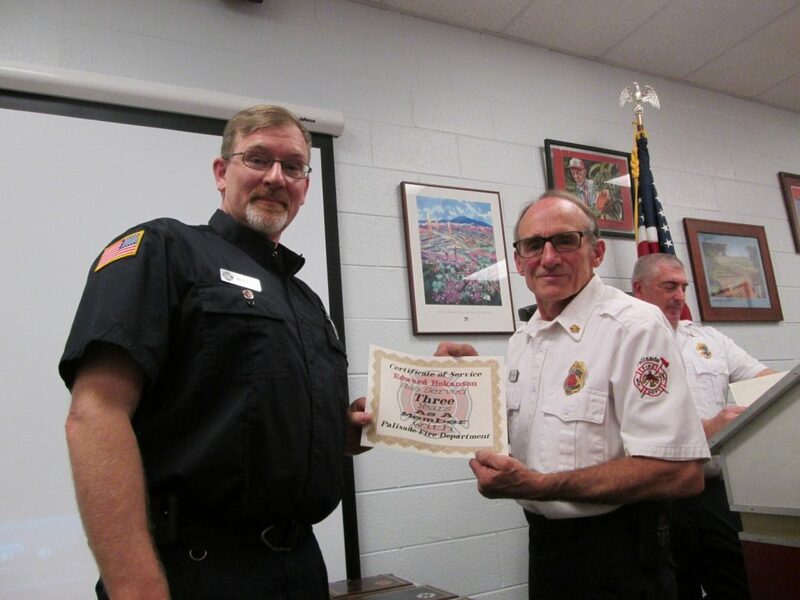 Fire Chief Richard Rupp (right) was honored for 34 years service by Mayor Roger Granat. 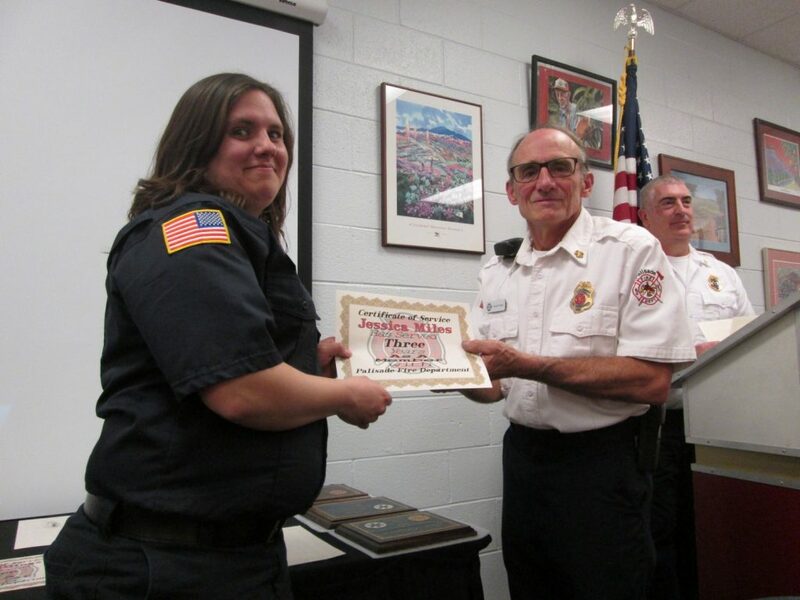 Maggie Sommerville, recently retired from the Palisade Rural Fire Protection District board, was recognized for her service. 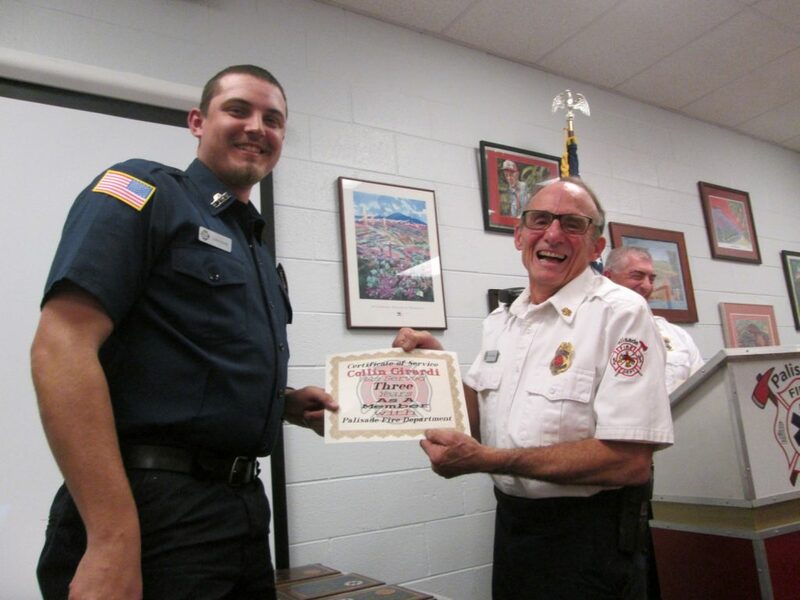 Zack Adams (left) was recognized for 6 years service by Fire Chief Rupp. 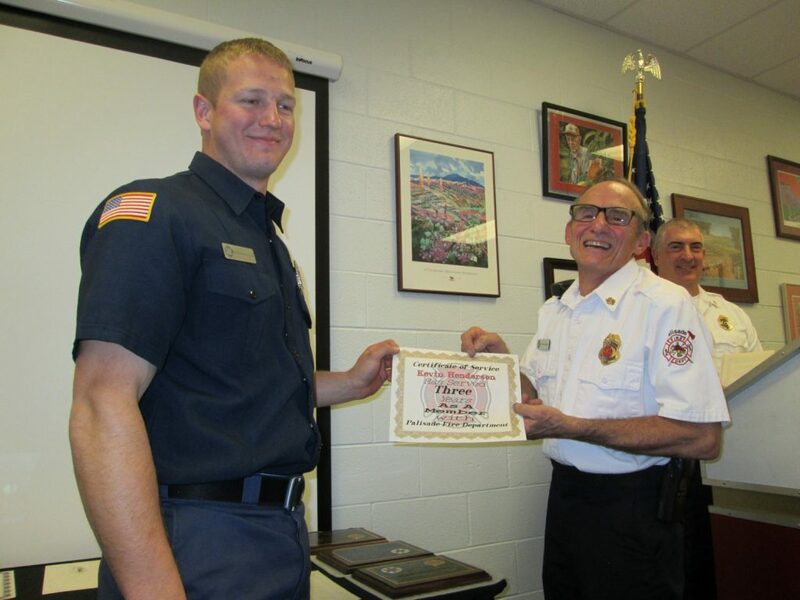 Alex Almy was recognized for 1 year service by Fire Chief Rupp. 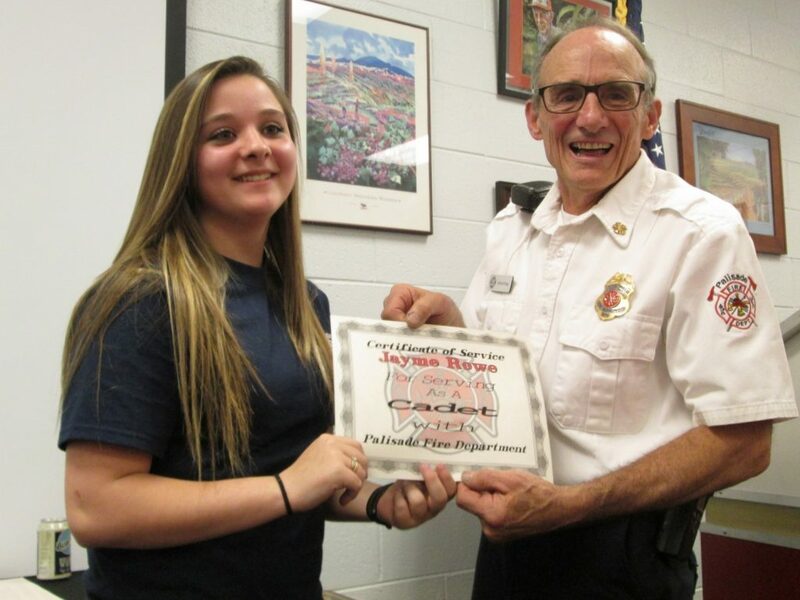 Katlyn Bremmer was recognized for 1 year service by Fire Chief Rupp. 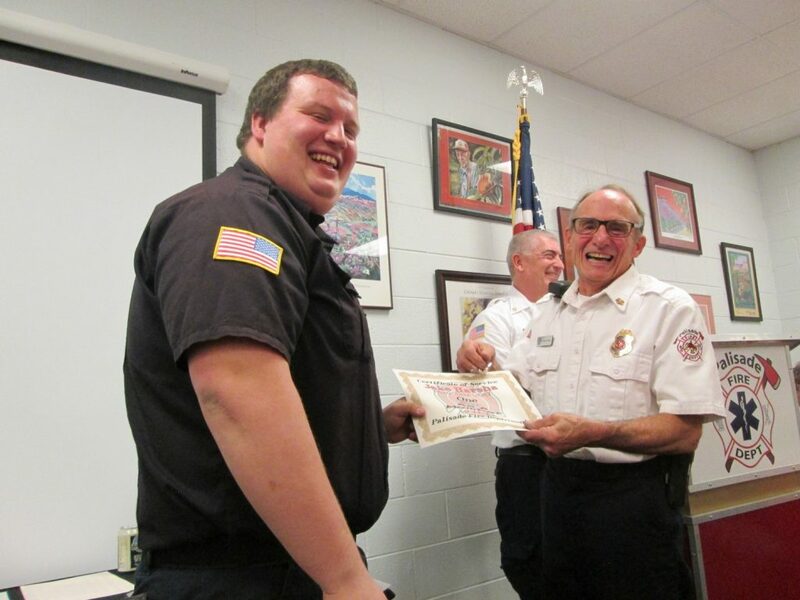 Devin Bugle was recognized for 2 years service by Fire Chief Rupp. 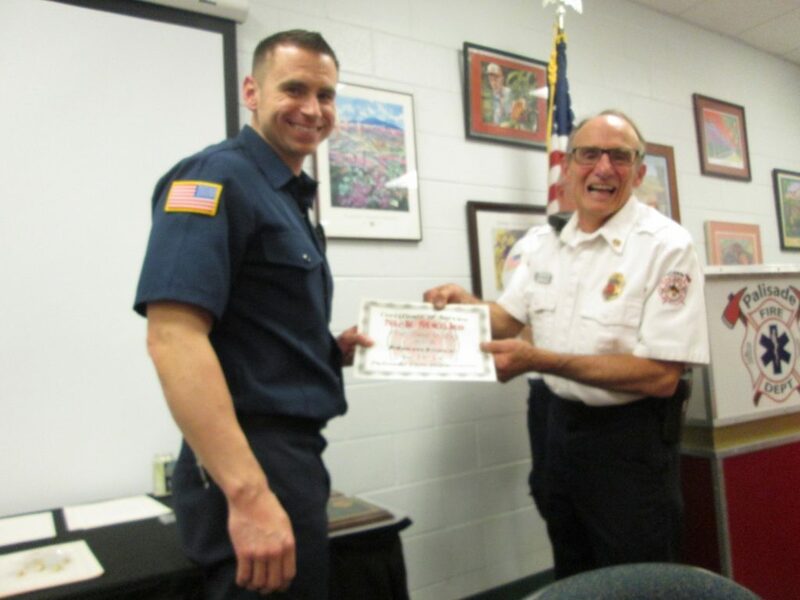 Matt Childs was recognized for 12 years service by Chief Rupp. Stacie Dix was recognized for 90 days service by Chief Rupp. Kelby Eslava was recognized for 3 years service by Chief Rupp. 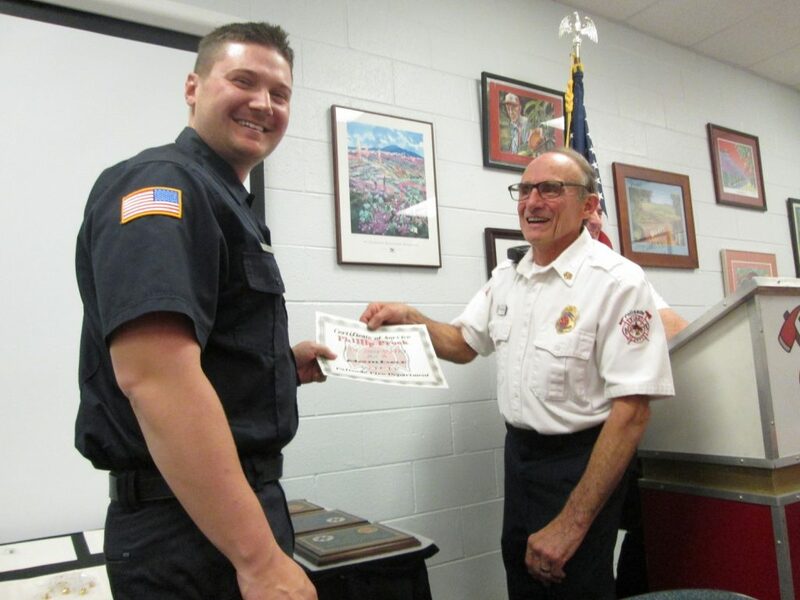 Kyle George was recognized for 3 years service by Chief Rupp. 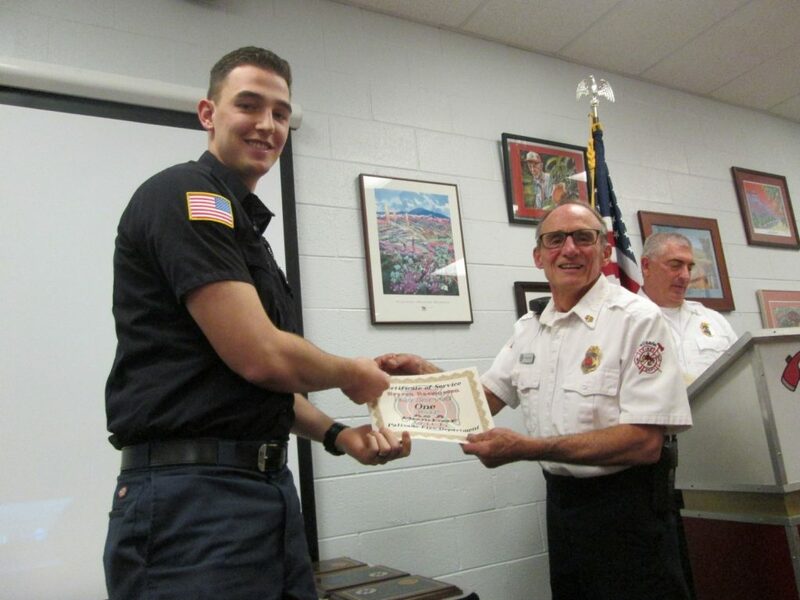 Collin Girardi was recognized for 3 years service by Chief Rupp. 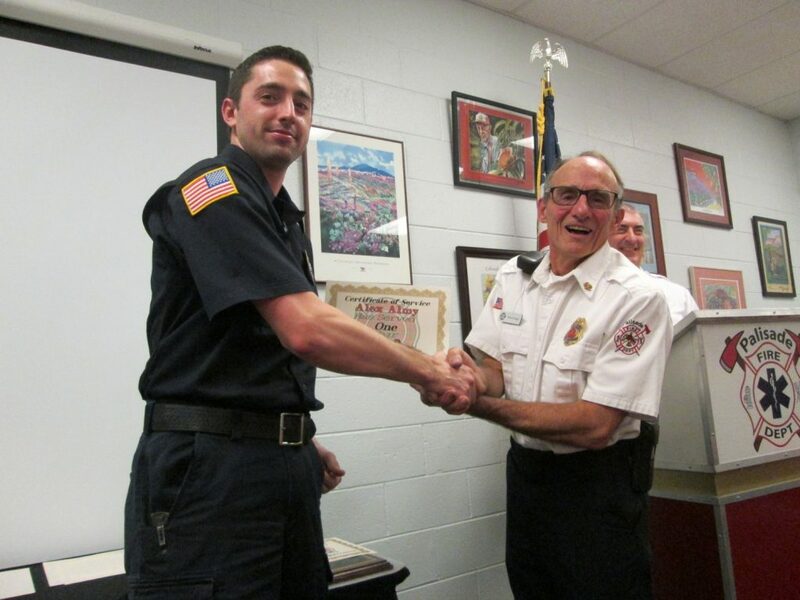 Jake Harsha was recognized for 1 year service by Chief Rupp. Keven Henderson was recognized for 3 years service by Chief Rupp. 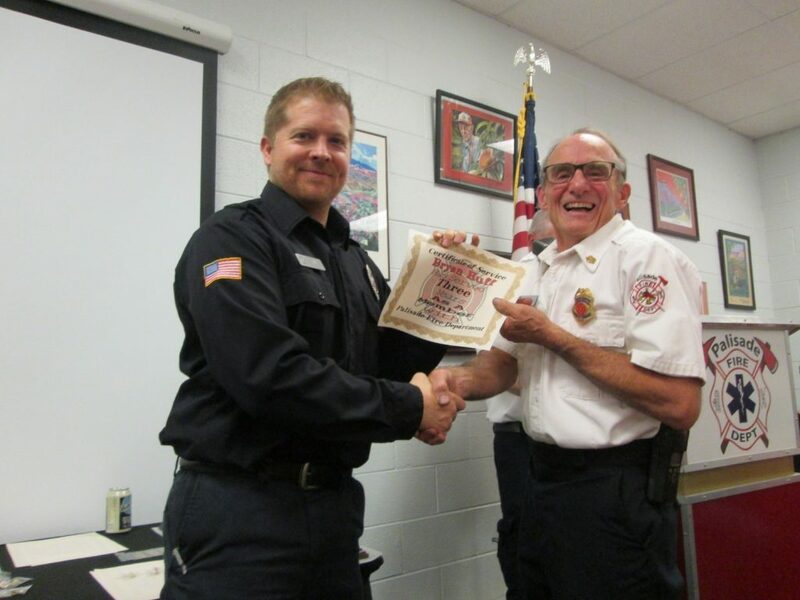 Bill Hokanson was recognized for 3 years service by Chief Rupp. 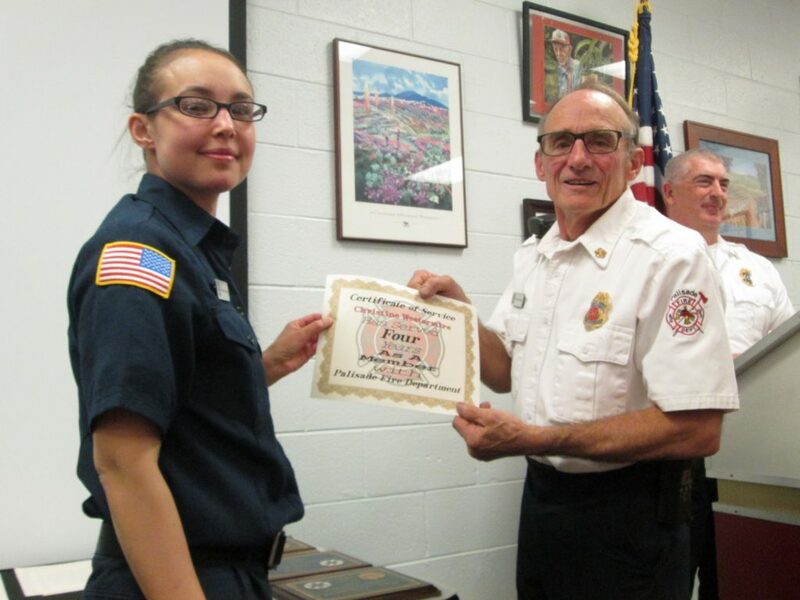 Jayme Howe was recognized as Cadet by Chief Rupp. Bryan Huff recognized for 3 years service by Chief Rupp. Jana Jarvis was recognized for 2 years service by Chief Rupp. 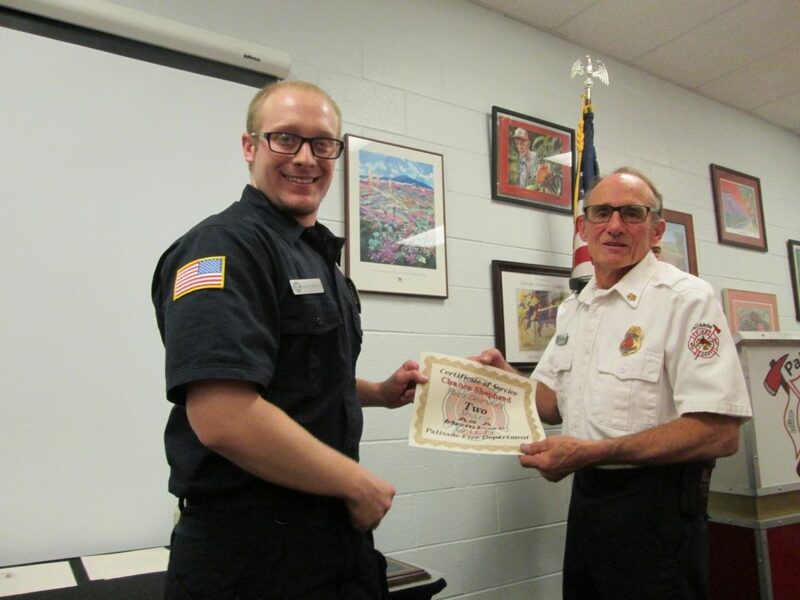 Jonah Larson was recognized for 1 year service by Chief Rupp. Jason Lee was recognized for 180 days service by Chief Rupp. Charlotte Martin was recognized for 6 years service by Chief Rupp. 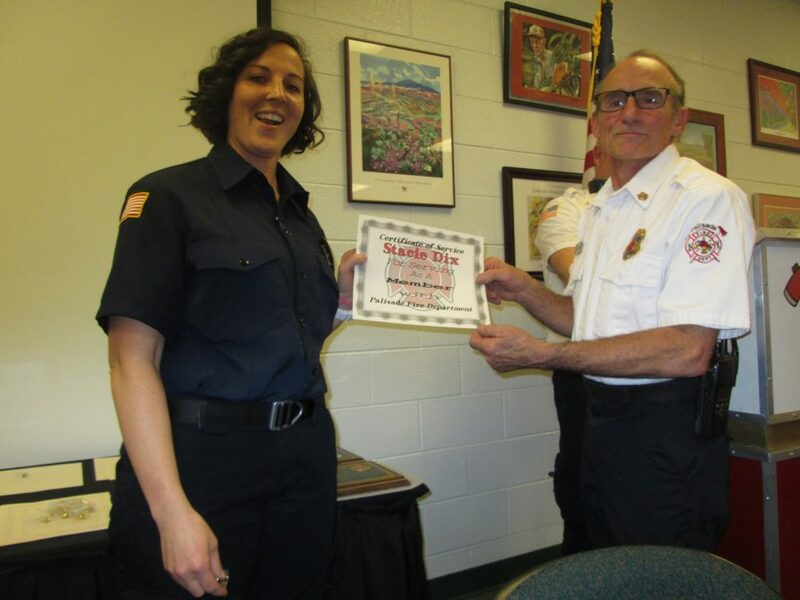 Jessica Miles was recognized for 3 years service by Chief Rupp. Brian Porter was recognized for 4 years service by Chief Rupp. 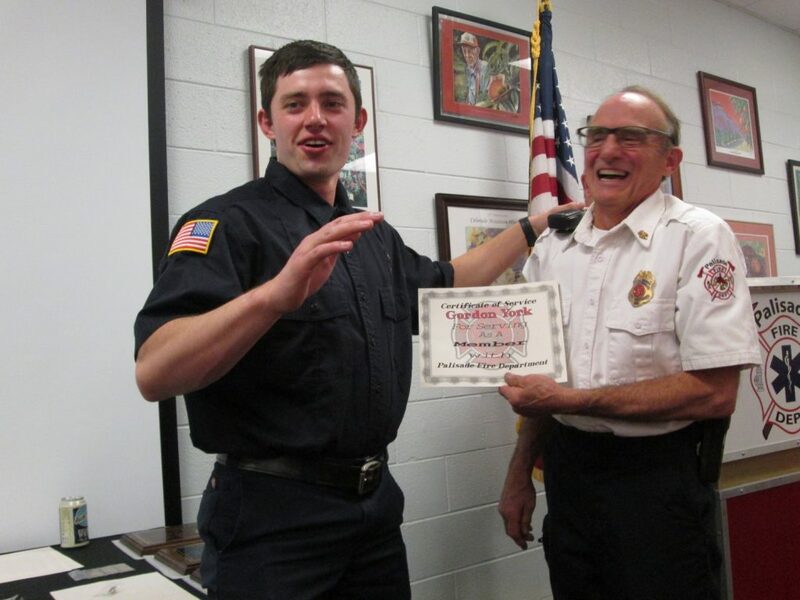 Phillip Prock was recognized for 1 year service by Chief Rupp. 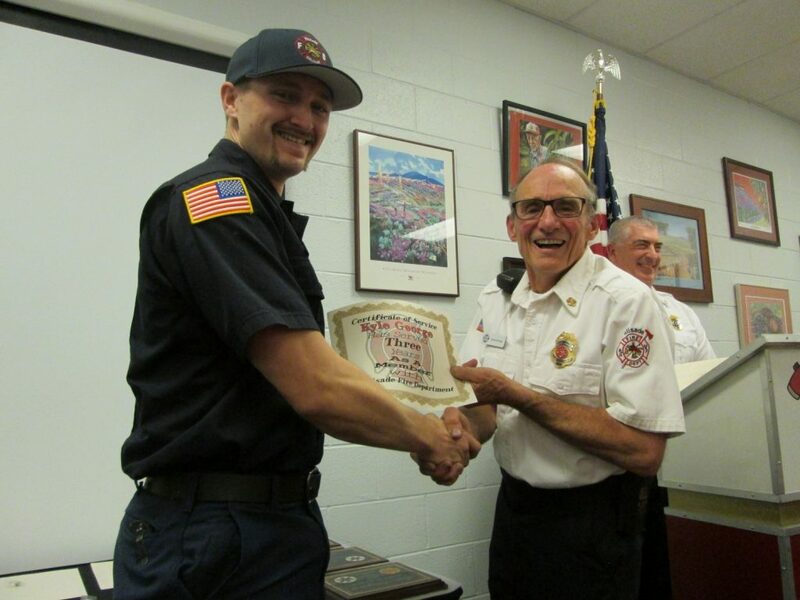 Jordan Quackenbush was recognized as transporter and driver of the year and 1 year service by Chief Rupp. 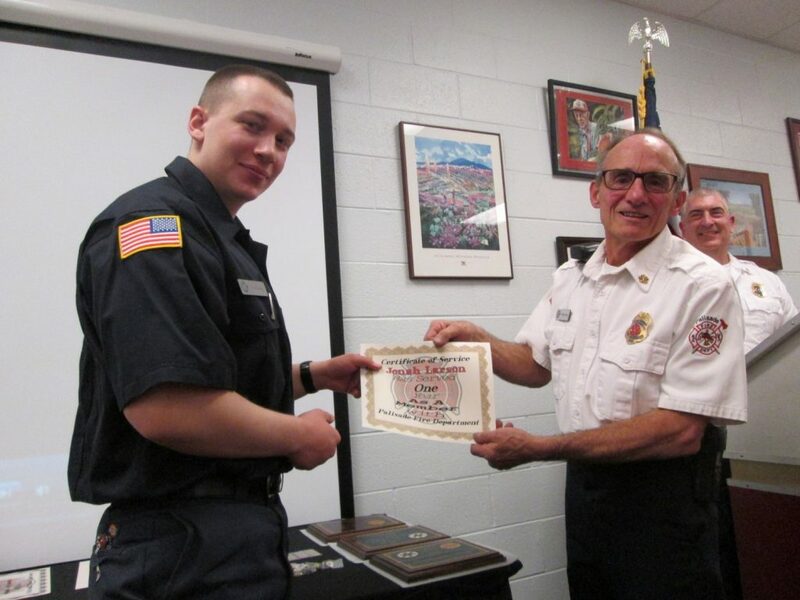 Bryson Rasmussen was recognized for 1 year service by Chief Rupp. 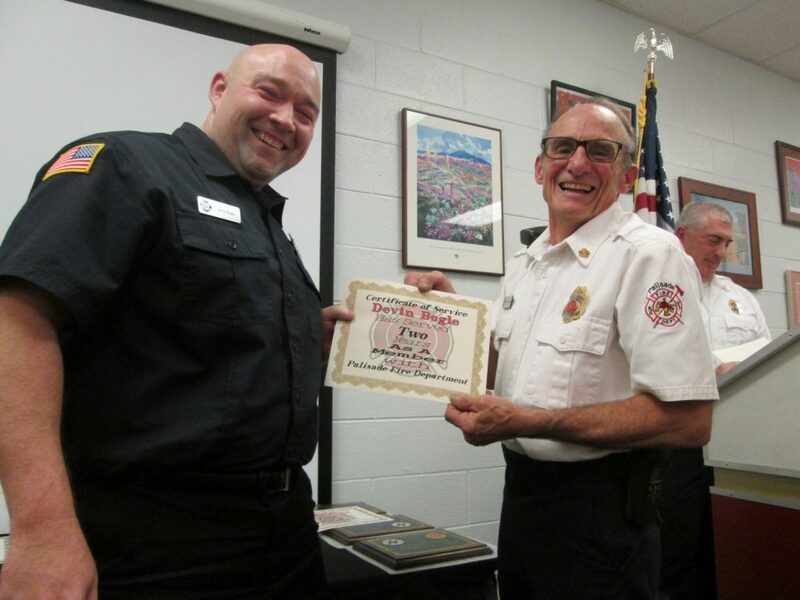 DuWayne Ritchie was recognized for 1 year service by Chief Rupp. Chance Shepherd was was recognized for 2 years service by Chief Rupp. 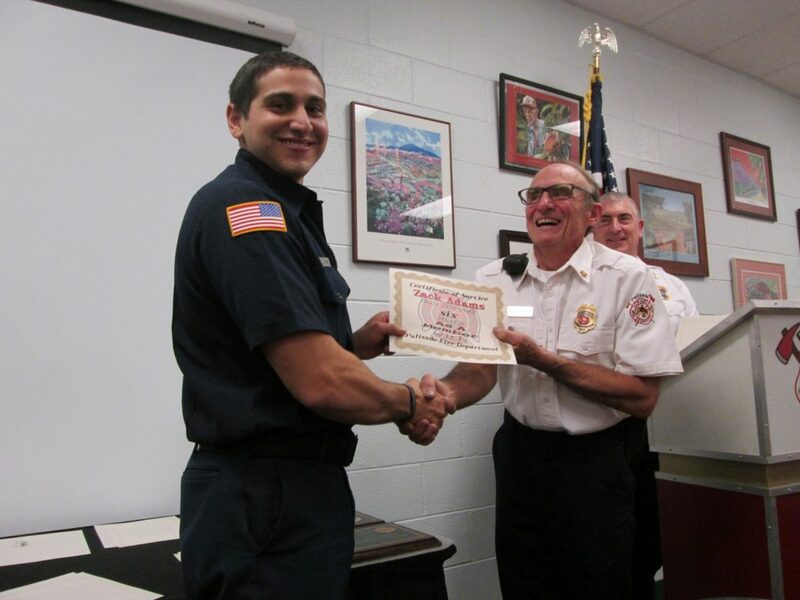 Nick Stanko was recognized for 1 year of service by Chief Rupp. 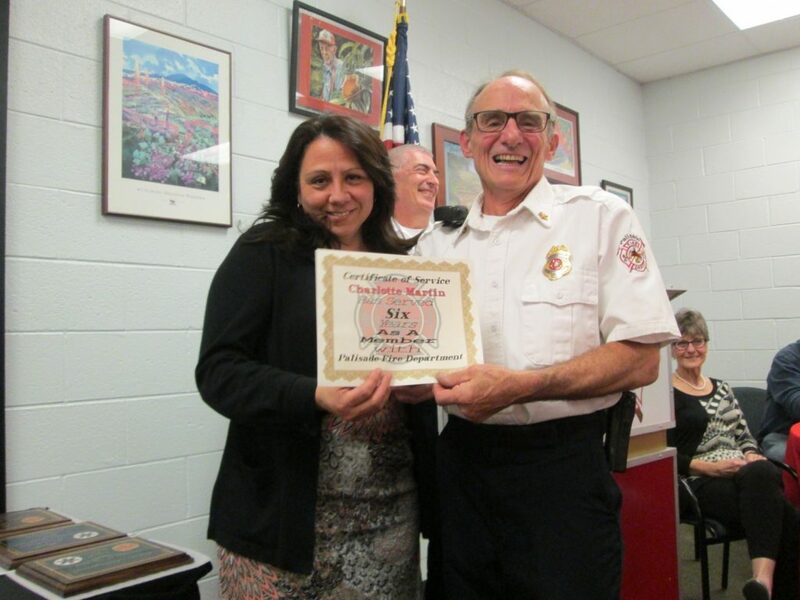 Christine Westermire was recognized for 4 years of service by Chief Rupp. 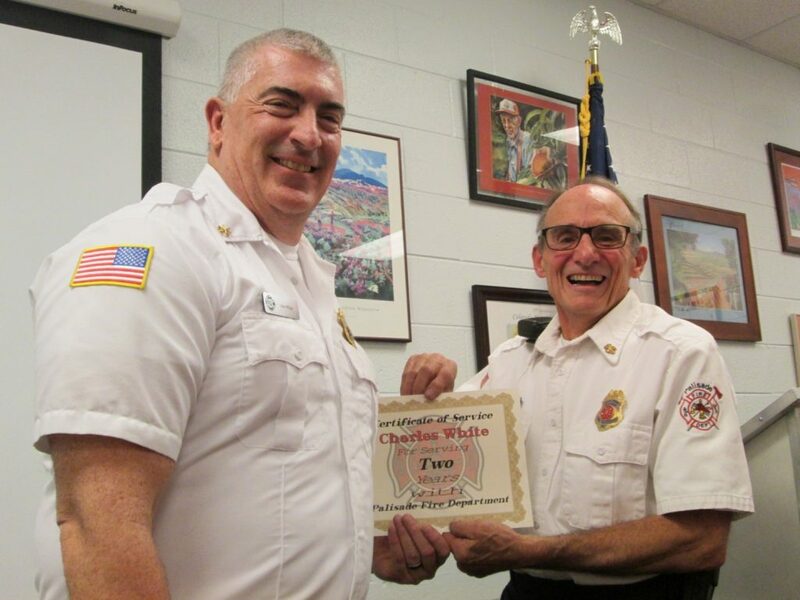 EMS Chief Joe White was recognized for 2 years of service by Chief Rupp. Gordon York was recognized for 180 days of service by Chief Rupp. ← Previous Story PRAB asks ‘Y’ Not?